This is another of the books that has been sitting on my shelf unread for years because it’s too heavy to carry around on the train. The Sagas of the Icelanders, published as a Penguin Classics Deluxe Edition, is a collection of some sagas and tales from the Viking age. Translated and edited by a number of scholars, it contains ten sagas and seven tales. With the maps, commentary and reference section it runs to nearly 800 pages and the deluxe edition is printed on thick rough edged papers. Which makes it very pleasing in the tactile sense, but pretty heavy. Thanks to my new morning routine, I finished The Sagas of the Icelanders this week after months of reading. There are worse ways to start the day for sure. The Sagas selected are a small sample of the whole body of literature. 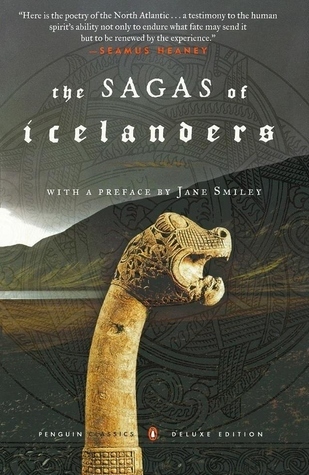 The emphasis in this collection are on the Sagas that depict a realistic view of the lives of Icelanders – or at least the lives of the Chieftain class. It starts with several very long sagas depicting the movement of significant families from Norway to Iceland, usually because of difficulties getting along with the earls competing to be kings but sometimes as a result of being outlawed for killing someone. They’re mainly set in 900-1000AD and were written down around 1100-1200AD which makes the writing of them contemporary with Chrétien de Troyes and slightly earlier than Chaucer and Dante. It also means that there is some uncertainty over the reflection of the spiritual practices of pre-Christian Icelanders and how much the writing down has sanitized the oral tradition. On the cover of the book is a comment from Milan Kundera that if the Sagas had been written in a less isolated European country they would have had a much more significant effect on the development of the modern novel. In this selection the Sagas and, especially, the Tales do really read like modern stories, notably the thriller. They are stories of people navigating social expectations of honour and the power of reputation. My favourites were the Saga of Ref the Sly, which is about a man who would prefer to avoid conflict but is pushed into it by others who think it is weak to not fight, and Egil’s Saga, which is the story of Egil Skallagrimson and his family’s generational feud with the kings of Norway. In the Saga of Ref the Sly, Ref wants to avoid conflict, so pretends he doesn’t know what is said about him. Others consider this weak and push him into answering these slights. Ref fights successfully but is then outlawed which meant that Ref is considered a criminal and can be killed by anyone. Whoever kills him will gain honour. The Saga deals with what it means to spend your life in hiding. Egil’s Saga spans 150 years and is largely set in Norway. The background is King Harald Fair-Hair’s merciless unification of the country of Norway. 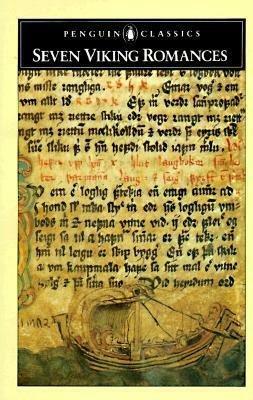 Egil’s grandfather and father refuse to swear allegiance to Harald and so go to Iceland and claim land there. The adventures of Egil reflect this stubbornness and inability to accept authority. He’s not an entirely likeable character but is very relatable. His sons are characters in their own Sagas. The Sagas are probably more accessible than most medieval literature and I enjoyed reading them. I’d recommend them. Possibly in a smaller, more portable, version of the book. Ulfar arrives in Stenvik with his cousin Geiri, thinking this is the last stop before returning home for exile. Instead, his life is irrevocably changed. 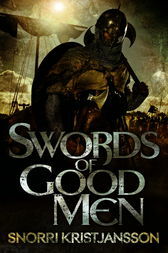 Ulfar and Geiri make a mess of approaching the ruler of Stenvik, Sigurd, on behalf of his father and has to stick around until they can make it right. To the south, Olav, devotee of the White Christ, is gathering a huge army and forcibly repressing worship of the old gods. To the north, the most fearsome Viking captains are assembling under the direction of the witch Skuld in order to destroy Olav. The battle will centre on Stenvik. I always enjoy Viking-based fiction and this is by an Icelandic author, which gives it an authentic feel. Probably entirely spurious, but there you go. Kristjansson has a stripped back, sparse style that carries the story forward at a cracking pace. Characters and setting are brought to life with deliberate, pointed description underpinning dialogue and action. It is enough but the setting, in particular, isn’t fully realised. Stenvik is the most completely evoked but it’s not clear where it sits in relation to anywhere else. The big battle at the end is fantastic. It was exciting, thrilling and very gory. It’s fair to say I wasn’t really expecting the ending to go the way it did. Diversity doesn’t come out brilliantly in this book. There is a character with a crippling illness and there are a couple of key female characters (in quite a large cast). They are quite stereotypical, but it’s fair to say that’s true of all the characters in the book. Most of the women are dead by the end and so are most of the men. Two thirds of the named characters are dead at the end. Very Shakespearean. Overall, I enjoyed it. It was fun, fast-paced and surprising. I think I bought this book looking for a text on magickal practices in Viking society. Seidways by Jan Fries isn’t that, for the good reason that there isn’t much known about those practices. Sometimes I skim the blurbs of books and make quick purchases, so I come away with a wrong idea about the book. Mostly, that works in my favour, because I might not have picked the book up if I’d had the right impression and that would have been a loss. 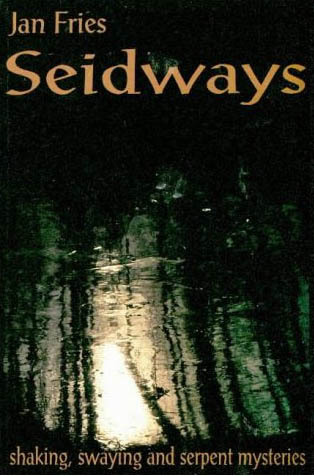 Seidways is an exploration of ecstatic magickal practices from around the world and from myth weaved in with the author’s personal experiences of using the techniques. Seidr, or seething, is altered conscious induced by shaking. Fries takes us on a bit of tour from Siberian shamanism, to African bushmen, to fragments of Celtic myths, to Sufi trance dancing, and most points in between. Refreshingly, the book is presented not as fact but as conjecture and opinion with open acknowledgement of how limited the source material can be. There is some discussion of belief, the placebo effect, and the role of theatre in healing. Much magic is directed towards healing the sick and is more effective when the patient and the practitioner believe it will work. Dramatic workings involving wild dancing, shaking, trembling and apparent possession by gods or spirits help to create that belief for both. For me, it broadened my idea of what a magician might look like and the techniques described in this book will find their way into my writing. Fries’ style is simple and engaging. It was easy to read, despite the esoteric subject, and each time I put it down I was looking forward to picking it up again. I enjoyed it.